Guan Yu is one of the playable Gods in SMITE. As a man, Guan Yu was the embodiment of loyalty, honor, and strength. As a God, he is a guardian of justice, a hero to the downtrodden, the Saint of War. In the ancient times of the East, a great war between Three Kingdoms raged. The warlord Liu Bei, and his friends, Zheng Fei, and the mighty Guan Yu swore an oath of brotherhood in a mystical peach garden, vowing to create a new, righteous world. Together, they fought countless battles against the warlords Cao Cao and Sun Quan, and Guan Yu grew famous for his combat prowess and unwavering honor. During the war, Cao Cao captured Guan Yu. At the time, Liu Bei's fate was uncertain, so he agreed to fight for Cao Cao under specific terms, chiefly that he would abandon Cao Cao if ever he learned the whereabouts of his sworn brother. Despite Cao Cao's gifts and promises of wealth, when Liu Bei resurfaced, Guan Yu immediately went to his side. Years later, Guan Yu again faced Cao Cao on the battlefield as the warlord fled from his defeat at Red Cliffs. Guan Yu cut off Cao Cao's retreat and obliterated his forces. Cao Cao, however, he spared and released, as a matter of honor. After his death, Guan Yu's spirit remained at a holy shrine, coming to the aid of nearby villagers in need, battling the cruel and selfish. From all over the East, worshippers came to the shrine and burned incense to honor him. Such popularity led to Faith, and thus Guan Yu was raised as a God, deified a few hundred years later. Now, he embodies the virtues he lived by. His statues, wielding a massive guan dao, ward against evil. Red faced to represent loyalty, his likeness is carried by merchants as proof they can be trusted. If their cause is just, he leads armies to victory. 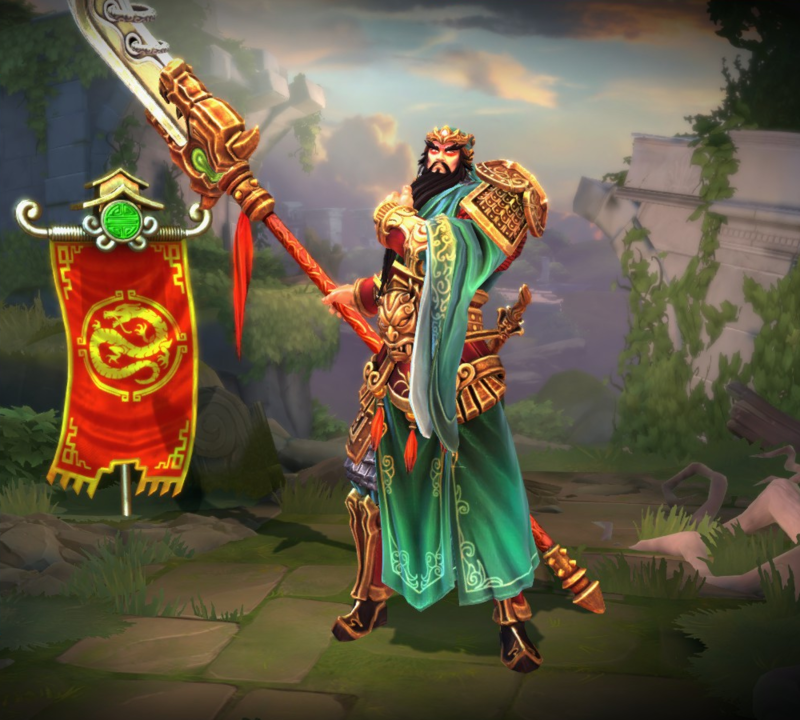 Among the Gods of any Pantheon, there are few as deadly and none as righteous as Guan Yu. Stacks are not consumed on use. The third hit of Guan Yu's hit chain cleaves and the last has a range of 16. Cooldowns are reduced for every god hit, including Guan Yu himself. Can deal up to 135/225/315/405/495 (+180% of your physical power) damage. Can steal up to 6/12/18/24/30 protections. New stacks refresh the buff/debuff's duration. Damage per Hit: 15/25/35/45/55 (+20% of your physical power) Protections Stolen: 2/4/6/8/10 Max. 3 Stacks. Protection Duration: 3/3.5/4/4.5/5s Boosted Protections Stolen: 3/6/9/12/15 Max. 3 Stacks. Can deal up to 595/805/1015/1225/1435 (+210% of your physical power) damage. Attack speed boosts the speed of the swings and move speed affects the charge's speed. Moving backwards slows the charge. Using this item allows you to teleport to any allied tower while Rooted in place. This effect is not interrupted by damage but is interrupted by hard Crowd Control. Dealing damage to an enemy god provides 1 stack. This effect can only occur once every 10s. Getting a Kill or Assist on an Enemy god provides 3 stacks. At 15 Stacks Warrior's Blessing Evolves, gaining +15 Physical and Magical Protection. Regenerates 0.3% of your max. Health every second. Enemy gods within 55 units have their Physical Protection reduced by 20. For each enemy god within 55 units of you, you gain a stacking buff that provides 7 Magical Protection and 7 Physical Protection. Stacks up to 5 times. Enemy gods within 55 units have their healing reduced by 25%. ALL enemies within 25 units are dealt 40 Magical Damage per second. Using this item reflects 40% of all damage you take, before mitigations, for the next 5s, back to its owner as Magical Damage. If you are dealt 150 * your level damage while this effect is active, the effect will end early. Using this item restores 40% Health and Mana lost within the last 5s. Using this item allows you to teleport to any allied tower or ward while Rooted in place. This effect is not interrupted by damage but is interrupted by hard Crowd Control. Enemies hit by your Basic Attacks have their Movement Speed reduced by 30% (20% for Ranged Basic Attacks) and have their Attack Speed reduced 15% for 1.25 seconds. As Guan Yu, stun three or more gods at once with your Ultimate, Cavalry Charge. As Guan Yu heal 3 or more of your teammates while your passive is charged. Guan Yu has been a free starter character for every new player account created since October 1, 2013. Accounts made before this date must still unlock him (5500 / 200 ). 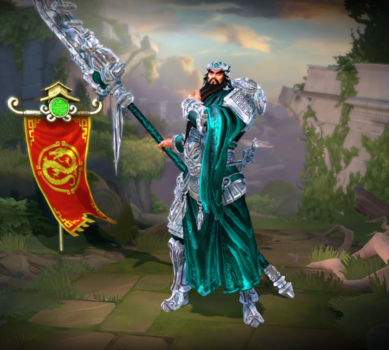 He replaced Poseidon, a change made so that new players would own one god of each class. Guan Yu received a major rework that was released with SMITE Beta Version 0.1.1705. For more information about the old version, check Guan Yu (Original). The warhorse used in Guan Yu's ultimate is known as the Red Hare, said to be one of the fastest horses in history during the Three Kingdoms. 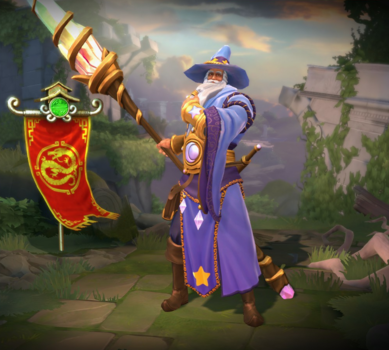 This is one of the few recolor skin that were released after the god was released. 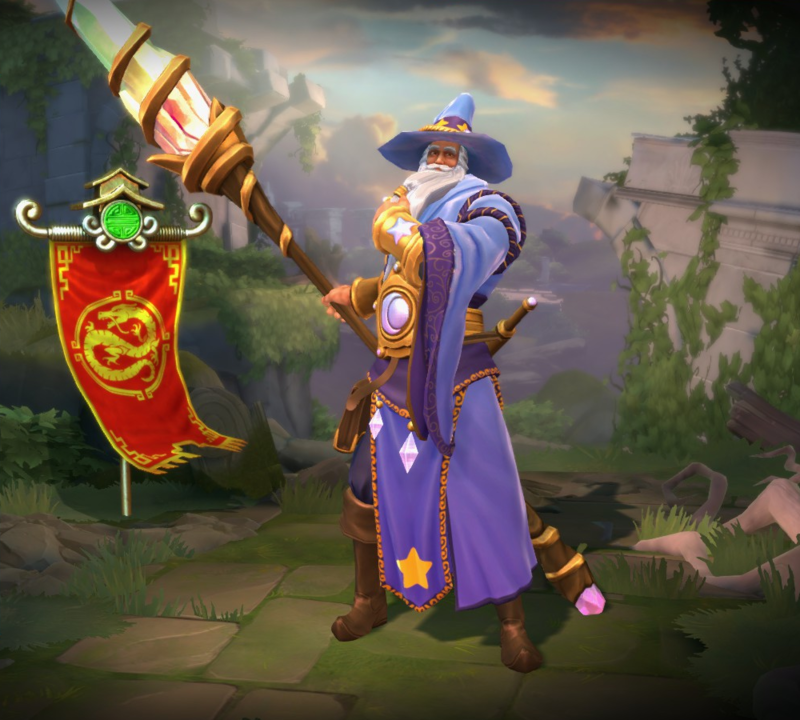 This skin was distributed in certains events. This skin shares it's theme with Convention 2016 Anubis, Convention 2012 Artemis, Convention 2018 Cernunnos, Convention 2013 Kali, Convention 2017 Khepri and Convention 2015 Tyr. I his death animation Guan Yu T-poses before falling on the ground. 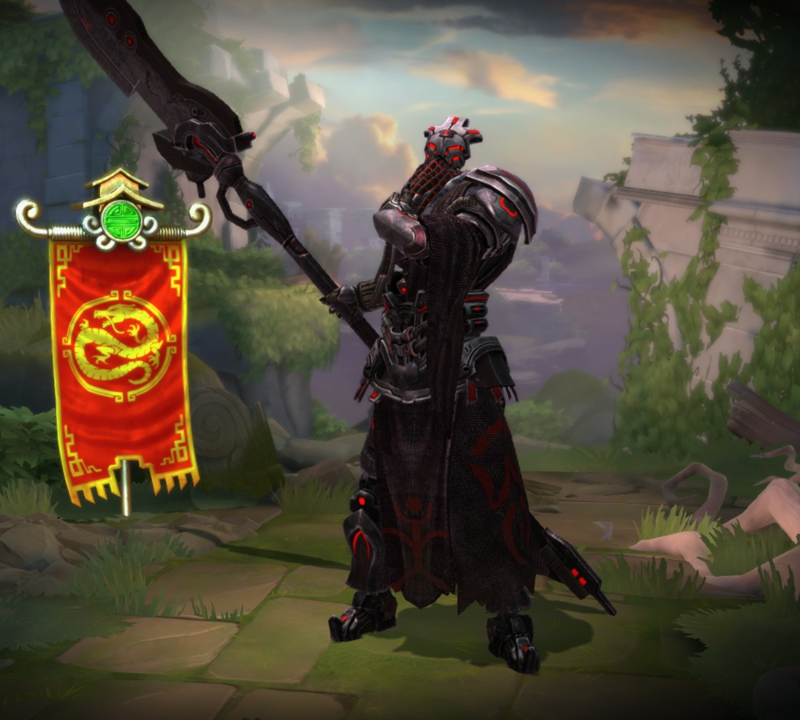 This skin shares it's theme with Grim Weaver Arachne, Grim Wraith Hades, Grim Eclipse Hou Yi and Grim Shadow Nox. His intro line "A wizard and his unicorn are never late. We arrive precisely when we mean to." is a reference to a quote from Gandalf in the Lord of the Rings. His line for his ultimate "Look at my horse, my horse is amazing, you must be jelly, because your horse is just basic!" is a reference to the viral video Look at my Horse Song!. His line for his ultimate "Puff, a magical unicorn appears, his horn gives me extra penetration!" could be a reference to the Old Spice commercial. His line for when he is low on health "Fly, you mules!" is also a reference to a quote from Gandalf. His taunt "I think you need to go back to *Hogwash* school of wizardry!!" is a reference to Hogwarts school of witchcraft and wizardry from the Harry Potter series. This skin can only be obtained by redeeming a 2014 convention skin code. This skin was part of the Adventures' Gold Vault. This skin comes with custom animations and ability effects. 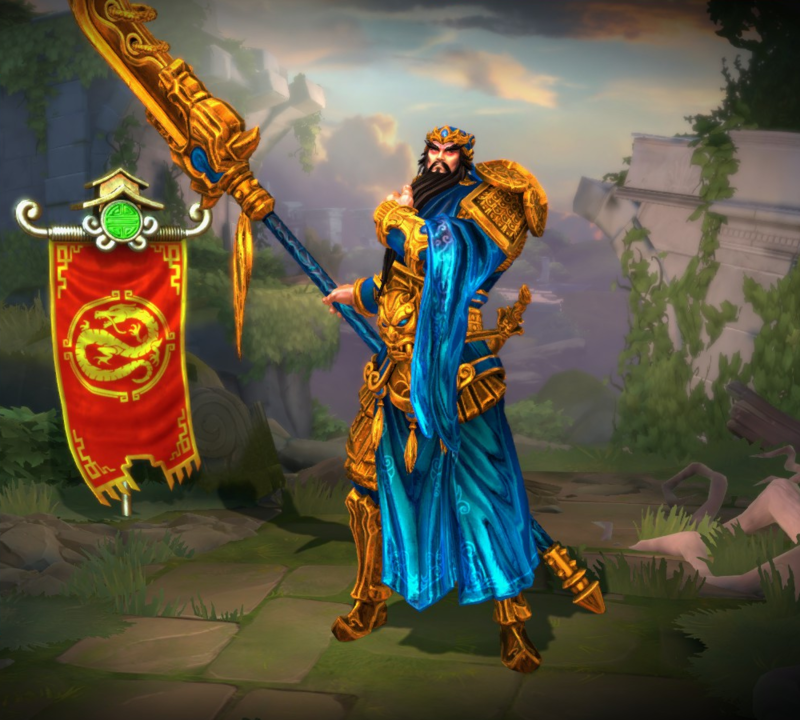 This skin was given as a reward to any players that reached Gold 5 or higher during the Season 5 Ranked. Boosted the bonus healing from 1.5x to 1.7x. Decreased Boosted Healing from 2x healing to 1.5x healing. The third hit of Guan Yu's hit chain now cleaves. The last hit of Guan Yu's hit chain range has been increased from 12 to 16. The first two hits of Guan Yu's hit chain have remain unchanged. Stacks now only reset when out of combat, rather than being consumed by a single ability. Mana per Level increased from 32 to 35. Decreased Mana Cost from 60/65/70/75/80 to 60 at all ranks. Increased Physical Power Scaling from 50% → 60%. Increased Duration of Protection Steal from 3s → 3/3.5/4/4.5/5s. Decreased Base Healing from 65/95/125/155/185 → 50/75/100/125/150. Decreased Boosted Healing from 130/190/250/310/370 → 100/150/200/250/300. Decreased Mana Cost from 60/70/80/90/100 → 60/65/70/75/80. Slow Reduced from 30% → 20%. Boosted Slow reduced from 60% → 40%. Increased Base Damage from 75/100/125/150/175 → 85/115/145/175/205. Fixed this ability not stealing protections properly from Guan Yu's target, nor giving him the correct amount. Decreased the number of hits to max stacks from 30 → 20. Increased Healing from 50/80/110/140/170 → 65/95/125/155/185. Increased Boosted Healing from 100/160/210/280/340 → 130/190/250/310/370. 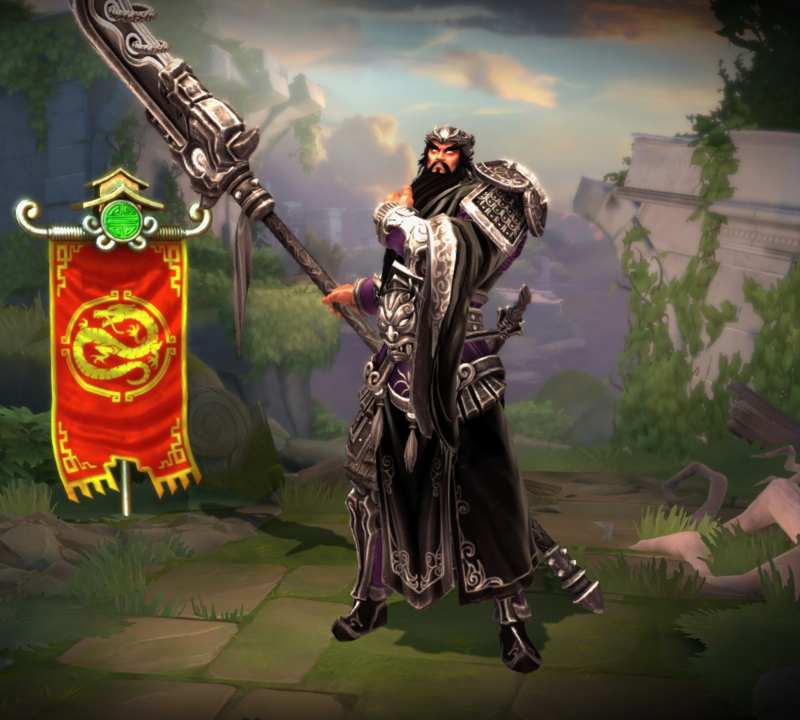 Each time Guan Yu deals or receives damage he gains a stack. Stacks are gained from minions and gods. At max stacks the next ability used will have a boosted effect. Maximum stacks increased from 20 → 30. Healing increased from 50/80/110/140/170 → 100/160/210/280/340 when boosted by Painless. Slow increased from 30% → 60% when boosted by Painless. Protection Steal increased from 2/4/6/8/10 → 3/6/9/12/15 when boosted by Painless. Slow increased from 20% to 40% and Stun increased from 1s → 2s when boosted by Painless. Increased base movement speed from 365 → 375. Fixed a bug where Cavalry Charge won't go into cooldown if Khepri revives him in the middle of it. Updated Passive text to include boost for dealing damage. Increased Slow from 20% to 30%. Reduced Cooldown from 14s to 12s. Fixed Cripple immunity not working. Added timer on the ground targeter indicating when the ability will expire and Guan Yu will be forced to dismount. Added to the list of healers for purposes of Assault selection. Reduced cooldown from 14 to 10s. Reduced mana cost from 60/70/80/90/100 to 60/65/70/75/80. This ability no longer provides protections. Physical and Magical protection debuff increased from 3/4/5/6/7 to 2/4/6/8/10. This ability now (or once again) steals physical and magical protections per hit, granting the protections to Guan Yu, at the same rate as the protections debuff. Physical Protection increased from 10/15/20/25/30 to 25/30/35/40/45. Attack Speed per level reduced from 1.5 to 0.9. In-Hand Power per Level reduced from 2.25 to 2. This ability no longer provides Guan Yu a protection buff per hit. Updated tooltip to indicate Guan Yu is immune to roots, cripples, and knockups while dashing. Recovery time reduced from 0.2 to 0.1. Protections buffed and debuffed per hit changed from 6/7/8/9/10 to 3/4/5/6/7. Fixed an issue where the damage range could fall short. Fixed an issue where victims could be hit multiple times. Fixed an issue where the same victims could be hit multiple times during the dash. Fixed an issue where enemies just outside the range of the dash could be falsely hit. 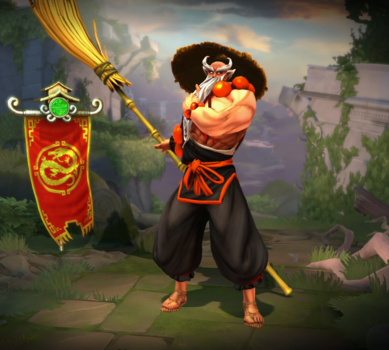 Guan Yu’s basic attack progression now uses the same standard hit cone on the final hit as the first three. This should remove inconsistencies in target selection between hits. Protection buff and debuff now scales 6/7/8/9/10 per rank, rather than being 10 at all ranks. Guan Yu has been given an all new 3D Model, FX, Animations and 2D Art. His damaged has switched from Magical to Physical, and several abilities have changed (most especially his Passive and Ultimate). As preparation for this change, Master Guan Fu also spent time in the gym and has grown some muscles and size. Fixed an issue where Taolu Assault would tick its damage an additional time. Gain 15 protections when near a map structure. Cooldown has been increased from 10s to 14s. Slow by 20% for 2s at all ranks. Each hit debuffs enemies protections by 10, stacking 3 times. Rank 2 & 3 are only debuffing by 15. Description doesn’t mention stacking 3 times. Stun lasts for 1.5s at all ranks. Focus conversion for healing has been changed to magical power conversion. Focus contribution has been reduced from 1.6 per Focus to 1.3. Passive is no longer active near destroyed structures. The amount of healing has been reduced from 50/85/120/155/190 to 50/80/110/140/170. The magical power contribution has been reduced from 35% to 30%. Mana cost has been increased from 50/60/70/80/90 to 60/70/80/90/100. Base damage reduced from 90/150/210/270/330 to 80/135/190/245/300. Cooldown reduction now properly applies to the abilities at the time they are used. If Tranquil Gift heals an allied player, the cooldown starts with 2 seconds removed. If Warrior’s Will hits an enemy player, the cooldown starts with 2 seconds removed. This change allows for greater variance between using these abilities in the right and wrong situations. Cooldown increased from 6 seconds to 10 seconds. Magical power contribution has been reduced from 50% to 35%. Magical power contribution has been reduced from 60% to 50%. Cooldown increased from 13 seconds to 15 seconds. Base damage per hit has been decreased from 20/30/40/50/60 to 15/20/25/30/35. Magical power contribution has been reduced from 20% to 15% per hit. Base starting damage has been reduced from 100/125/150/175/200 to 75/100/125/150/175. Magical power contribution has been reduced from 30% to 20%. 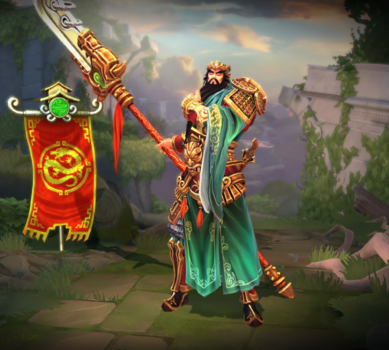 Guan Yu has been added to the game. This page was last edited on 2 March 2019, at 21:03.